Laparoscopic Cholecystectomy for Asa III Patient’s in Day Surgery. Why Not? Aims. Laparoscopic cholecystectomy (LC) in day – surgery (DS) settings has become the gold standard for treatment of chronic calculosis cholecystitis. The authors report their 4-year experience with LC to determine its safety, applicability, feasibility for selected patients. The aims of this study were to evaluate the outcome of LC for the patients with ASA III in the treatment of gallstones in Kaunas Hospital Day Surgery Centre. Methods. A retrospective analysis was carried out on the 234 elective LC in DS settings cases dating from 2005 to 2008. 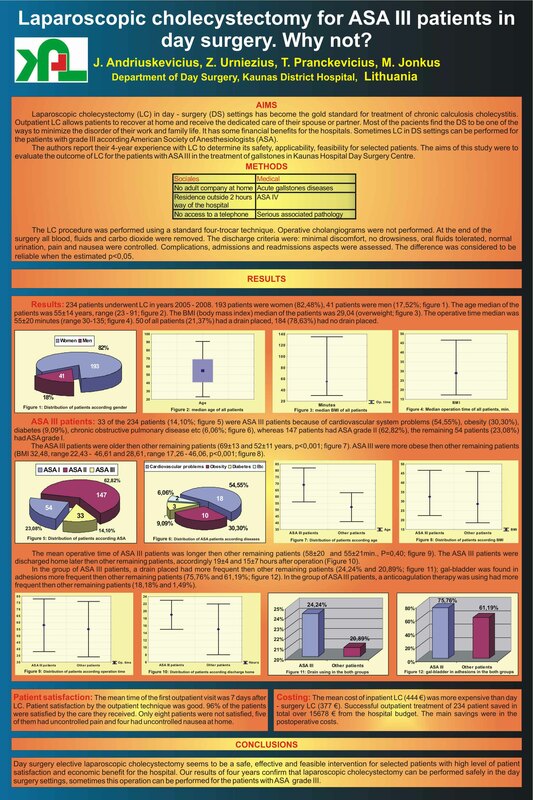 33 patients were ASA grade III. The exclusion criteria were medical: acute gallstones, diseases, ASA IV, serious associated pathology; sociales: no adult company at home, residence outside 2 hours way of the hospital. The LC procedure was performed using a standard four-trocar technique. Operative cholangiograms were not performed. At the end of the surgery all blood, fluids and carbo dioxide were removed. The discharge criteria were: minimal discomfort, no drowsiness, oral fluids tolerated, normal urination, pain and nausea were controlled. Complications, admissions and readmissions aspects were assessed. The difference was considered to be reliable when the estimated p<0,05. Results: 234 patients underwent LC in years 2005–2008. 193 patients were women (82,48%), 41 patients were men (17,52%). The age median of the patients was 55±14 years, range (23 – 91). The BMI (body mass index) median of the patients was 29,04 (overweight). The operative time median was 55±20 minutes (range 30-135). 50 of all patients (21,37%) had a drain placed, 184 (78,63%) had no drain placed. 33 of the 234 patients (14,10%) were ASA III patients because of cardiovascular system problems (54,55%), obesity (30,30%), diabetes (9,09%), chronic obstructive pulmonary disease etc (6,06%), whereas 147 patients had ASA grade II (62,82%), the remaining 54 patients (23,08%) had ASA grade I. The ASA III patients were older then other remaining patients (69±13 and 52±11 years, p<0,001). ASA III were more obese then other remaining patients (BMI 32,48 and 28,61 p<0,001). The mean operative time of ASA III patients was longer then other remaining patients (58 and 55 min., p=0,40). The ASA III patients were discharged home later then other remaining patients, accordingly 19 and 15 hours after operation. In the group of ASA III patients, a drain placed had more frequent then other remaining patients (24,24% and 20,89%); gal-bladder was found in adhesions more frequent then other remaining patients (75,76% and 61,19%). In the group of ASA III patients, a anticoagulation therapy was using had more frequent then other remaining patients (18,18% and 1,49%). In ASA III patients group were really severer patients then in I and II ASA patients group, but there were no conversions to open procedures. There was no bleeding, no visceral injury, and no mortality. Conclusions. LC in DS settings seems to be a safe, effective and feasible intervention for selected patients, even they had ASA grade III, with high level of patient satisfaction and economic benefit for the hospital.